Leslie Menges, retired nurse and teacher who now acts as a caregiver for her husband, speaks to a woman in one of SourcePoint’s support groups for caregivers. Delaware County residents Leslie Menges and her husband, Dallas, have been together since 1966, but after Dallas was diagnosed with Alzheimer’s, they have a new relationship — caregiver and care receiver. Leslie Menges is one of approximately 43.5 million adults in the United States who acts as an unpaid caregiver, according to the National Alliance for Caregiving and AARP, and one of 351 Delaware County caregivers being assisted by SourcePoint. Menges said she receives assistance from SourcePoint in several ways with two of the most important being support groups and adult day services. “One of our mantras in our support group is I have to do everything myself now,” she said. Menges added she does everything for their family now from chores like mowing the lawn to managing finances, and having a support group has made the transition easier. She said SourcePoint hosts a monthly support group for caregivers, and the first time she attended, she thought it was a course on how to be a better caregiver. “I’m leafing through what we were going to discuss because I’m a retired teacher and I just got teary-eyed because I realized this wasn’t a class on how to be a better caregiver, it was a class about taking care of myself,” Leslie Menges said. In addition to the support groups, SourcePoint also hosts regular workshops for caregivers as well as Family Caregiver forums on Facebook where caregivers can share resources and information. The other main service Leslie Menges takes advantage of at SourcePoint is its partnership with Willow Brook, which allows Dallas to spend some time at Willow Brooks’ adult day services. She said through SourcePoint and Willow Brook’s partnership with DATA Bus, she pays mere dollars to transport her husband to and from Willow Brook’s adult care service. Menges said the service is very beneficial because it keeps her husband active and gives her time to get chores done or do other work. Bob Horrocks, executive director of SourcePoint, said these services give caregivers a chance to get out, run chores, or just have a minute to rest. “It’s tough for people,” Horrocks said. “There’s a lot of guilt. ‘This is my spouse, I signed up for this.’ … but you can’t be a good caregiver if you are burned out. Horrocks said the caregiver services are one of many services made possible at SourcePoint because of the senior services levy. For more information about SourcePoint or their caregiving services, visit mysourcepoint.org. 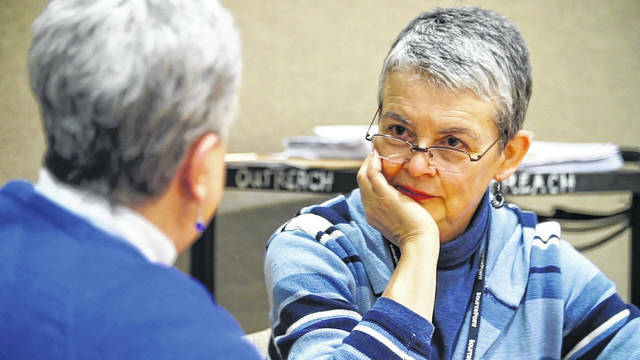 https://www.delgazette.com/wp-content/uploads/sites/40/2018/05/web1_SourcePoint_Leslie-At-SourcePoint.jpgLeslie Menges, retired nurse and teacher who now acts as a caregiver for her husband, speaks to a woman in one of SourcePoint’s support groups for caregivers.